Whenever you are handling your swim cap, whether putting it on, adjusting or removing it, or just generally handling it, try to keep your fingernails away from it as much as you can. It is difficult if you have long nails. Maybe put on some latex gloves when handling it. Silicone caps are better quality and have other benefits. 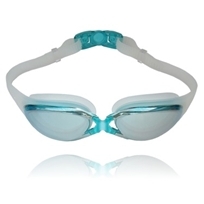 Many swimmers will wet the hair slightly with fresh water or put some hair product on their hair before putting the swim cap on because this makes it more easy to slide on. Be mindful of the fact that some pools won’t allow you to use hair products as it can pollute the pool. Many women have long hair so before a cap is donned, the hair should be gathered in some way appropriately about the head. It could be put in a bun, twisted, braided or maybe a light hair net could be used. Never ever use a clip, pin or any sharp object to keep the hair in place or this could lead to a rupture of the cap. When putting it on, make sure that the front of the cap is facing downwards and the back facing upwards. Slide your hands into the cap but make sure that your thumbs are outside of the cap facing upwards. Using the back of your hands, gently stretch it open until the opening is large enough to fit over your head. Now you will have to position the cap over the top of your head. Some swimmers find that bending over to do this is easier for them, so you can experiment to find what works best for you. Bring the cap towards your head so that the inside front of it catches your forehead. In one movement, move the cap backwards over the rest of your head and bring the back of it down as far as it will go. Gently slide your hands out from the back of the cap making sure that your fingernails are out of the way. Your cap will need adjusting now. The wisps of hair that protrude must be very carefully pushed inside of it making sure that the skin and the cap have as tight a seal as possible. It may be that the nape of your neck has a minimal amount of hair that reaches beyond the back of the cap. This is a minimal problem though and you might experience some water getting in. If there are any wrinkles or pocket of air, simply smooth them out using the palms of your hands and fingertips. To remove the cap, slip your fingertips into the cap and push upwards. I find that it is best to do this just in front of the ears. If you follow these simple rules, you should have no problem with tearing your cap. Check our caps out here on Amazon. 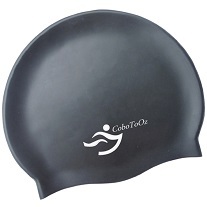 To find out more about looking after your cap, please make sure to visit – how to minimize the problem of tearing your swim cap.